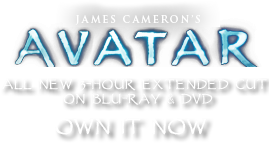 Banshee, Mountain | Pandorapedia: The Official Guide to Pandora | Own AVATAR on Blu-ray & DVD Now! The mountain banshee rookery is high in the Hallelujah Mountains. The largest rookery, which features the biggest specimens (and therefore the best to tame for riding), is in grottoes and outcrops on a sheer cliff face of Mons Veritatis, one of the largest of the floating mountains. 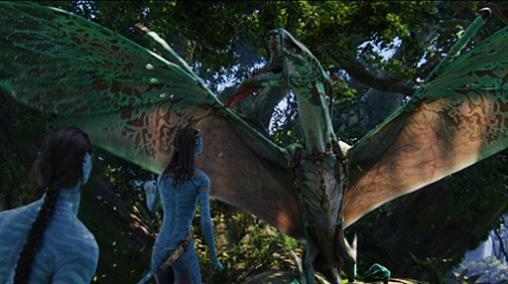 It is here that the Na'vi come to select (and be selected by) a banshee for domestication. The bonded mountain banshees nest in the highest branches of Hometree, where they can be close at hand for their Na'vi rider. Like many of Pandora's creatures, the banshee also has a remarkably strong cell structure. This structure, which is a biologically produced carbon-fiber, makes their bones much lighter and stronger than any organic Terran equivalent. This in turn allows them to generate more power and lift with every flap. The biochemistry of their muscle tissue allows them to generate nearly twice the force per pound of muscle as terrestrial flying animals such as bats and birds. This, again, generates tremendous metabolic heat. The hollow bones are connected to the bellows-like lung, and cooling air moves through the long bones of the fore and aft wings. Each large fore-wing has three Primary Vanes at its tips. These form like the wings of a dragon fly, by the extrusion of a resin into the veins of a flexible membrane, which unfurls then cures in the sun into a rigid transparent vane. These vanes are replaced through molting. The purpose of the vanes is to generate lift and to provide fine control in flight. They are also quite robust structures designed to fold inward if the wingtips hit tree limbs or other obstacles. The smaller hind wing, or canard, plays a dual role in Banshee flight. In level flight, when large amounts of power are not required, the creature propels itself with the fore-wing and uses the canard as a tail-plane, for steering. When more power is needed, for take-off and climbing, or escape from an aerial predator such as the leonopteryx, the canard becomes an additional wing, flapping to provide propulsion. The steering vane under the banshee’s lower jaw and the featherlike fan at the tip of the tail provide additional turning authority for high performance aerobatics. The banshee is highly maneuverable and can dive at speeds close to 140 knots. The banshee has two primary eyes which see in full color in roughly the same spectrum as human vision. Aft of the primary eyes are smaller secondary eyes, which can move independently or together with the primaries. They see in near infrared, for night hunting. They also are highly sensitive to motion, and act as an early warning system against attack from the rear. All four eyes are protected by lids and by transparent nictating membranes. Forward of the primary eyes are lines of sensor pits. These are thought to provide airflow information in flight, like a pitot tube on an airplane. Another hypothesis is that they are sensitive to sound, and have an echolocation role, by sensing the reflected sound of the banshee shrieks. Banshees were so named because of their piercing signature cry. This is only one of the banshee’s many vocalizations, and is thought to be a distant call defining territory. Other vocalizations include a warning hiss, which is part of an overall threat display posture, and a short sharp shriek which denotes stress or fear. There are also warning sounds, and other stress vocalizations, as well as more guttural vocalizations associated with social grooming and contentment. The banshees are social animals, and communicate frequently, generating quite a din at rookeries and other communal areas. Habitat Mountainous regions of Pandora, including Hallelujah Mountains. Anatomy Leathery membranous wins stretched taut over hollow bone structure. Large distensible jaw. Complex coloring scheme. Teeth are obsidian-like and extremely sharp. Bones composed of biologically produced carbon-fiber composite. Feeding Ecology Shape of jaw indicates that ikran may have evolved from fish. Size Wingspan of up to twelve meters. Notes Can make subtle adjustments to flight attitude and speed with an articulated tail tip, which can flare or remain tucked.